We’re back, baby! And this week the Three Amigos recap and review Gary Con VI, the first game convention attended by all three judges. We talk about the “What’s New at Goodman Games” seminar, games we played and players we killed. Plus! We announce the winner of the write up a Doug Kovacs monster contest! 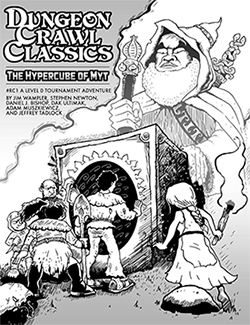 And don’t forget to check out the winning entry in the Doug Kovacs illustrated Dungeon Denizens contest! Praise Bobugbubilz! Great to have you back, guys. A few things, good gentle sirs. First off, very glad to have you back. Second off, many thanks to the author of your second email of the show, who clearly is of discerning taste. Third off, please do have your contest winner contact me. I will be happy to supply a prize! You are a scholar and a gentle being, good sir. What an early easter gift…a new spellburn podcast and news that I won the Doug Kovacs monster contest!! I am so glad you guys enjoyed my creature…I had a lot of fun writing it. I just want to thank you guys for taking the time to read my entry, Doug for drawing the beast and Daniel Bishop for the contest idea and prize offer. Doug, I would love to know what you think of my interpretation of your sketch? Is it even remotely something close to any ideas you had when drawing it? Just curious? Big fan…love the show…keep up the good work! Mar-Max, what adventure (that I wrote) would you like, and what is your email address? I’ll “gift” it to you via RPG Now by this time next week. You can always send me a private message via Google+, or on the Goodman Games forums (Raven Crowking) if you like. I like your idea a lot. I just imagined this thing was a wierdo and probably pretty tough, but not much more..(couldn’t spare much more brain power at the time) . I wanted it to be open to anyone’s backstory. My buddy and I played in Jim’s MCC game and he and DMCojo did indeed send my buddy and I scurrying to buy the DCC core book. Now my son says he needs a copy too! Blackthicket…let me know if you want to make the trip to Grand Rapids for a game of DCC!